“I felt I lost the puck a few times, made some bad decisions, some turnovers. But I’ve just got to play it simple,” Pettersson said. The 20-year-old rookie, who ran his point total this season to 44, missed five games after suffering an MCL sprain on Jan. 3. Pettersson’s goal gave Vancouver the early lead, but the team had to rally from a 2-1 deficit after an ugly second period. Roussel broke a 2-2 tie with 6:47 remaining in the game, tipping in a shot fired by Jake Virtanen. The play came less than three minutes after Wings goalie Jonathan Bernier stopped Roussel on a breakaway. Horvat evened the game 7:27 into the third period. 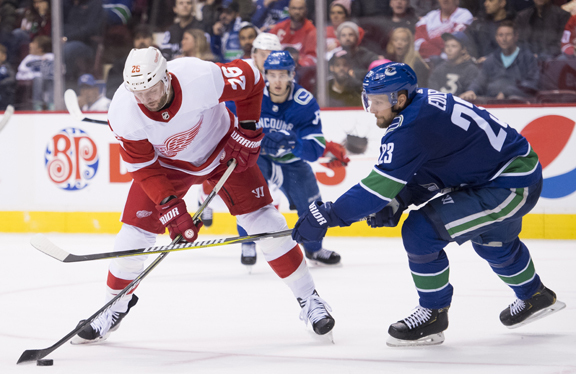 Frans Nielsen and Thomas Vanek scored for Detroit as Bernier had 28 saves.